Harley Rakes built for the more powerful machines available today, the Harley Rakes offers greater strength with the same non-bulky manueverability that's easy on your job site and machine. Pure Carbide Teeth shaped for longer life and the best possible seedbed. Roll-back barrier above the the roller allows you to quickly react to soil moisture conditions, raising the barrier allows for larger material and faster soil drying in muddy sites. Dual independently adjustable gauge wheels for skim passes for over-seeding or adjust to cut drainage grades. Quick and easy removable end plates for windrowing and reverse box raking.... no bolts just pull the pins. 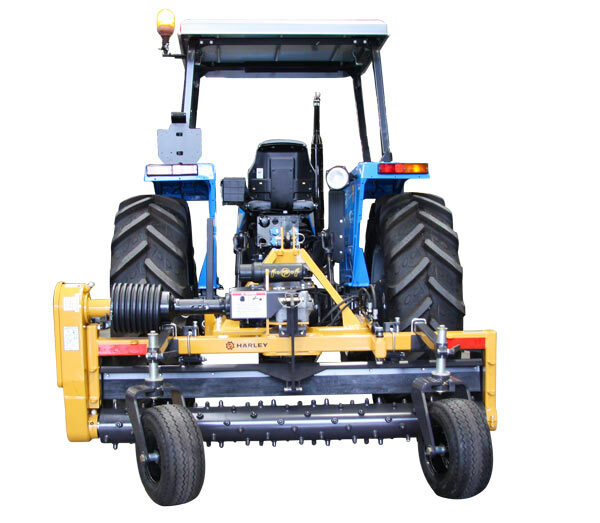 The Harley Rake is more of a finessing tool, its ideal uses are Leveling, Grading, Seedbed Preparation, Sloping, Site Preparation, Lawncare, Golf, Wineries, Paving and contractors.